Almost every time I write about something on my blog, it’s because I’m bursting with love for it. Especially for my travel posts–I get my motivation to publish from my excitement over those experiences. I’m not bursting with love today. I don’t even blink before proclaiming my love for Wyoming, and I definitely don’t hesitate say South Dakota was the absolute worst. I felt anxious, restless, and uncomfortable the entire time. I let out the biggest sigh of relief when we crossed the border into Minnesota. Maybe it was the wide-open spaces. Maybe it was the distinctly passing-through-only feeling. Maybe I just felt let down–I wanted to like South Dakota, I really did, but I couldn’t. Maybe it was Mount Rushmore (or, as Matt joked, Mount “TakeYourTime-Less”). You’d think seeing the one thing South Dakota has to offer would feel worthwhile, but I left wishing for my time and money back. It’s just carved heads in a rock. And I knew that, of course. That’s what I was expecting. But I was hoping that I’d have another Egyptian Pyramids experience (in which I professed “I’ve seen pictures, I don’t need to see the real thing” and then was blown away). Frankly, I thought the original rock formation looked way cooler than the sculpted formation. Why cut into something that’s naturally beautiful? And the Presidential Trail isn’t even pretending to be a natural trail; it’s literally a set of stairs to see the heads from a different angle. 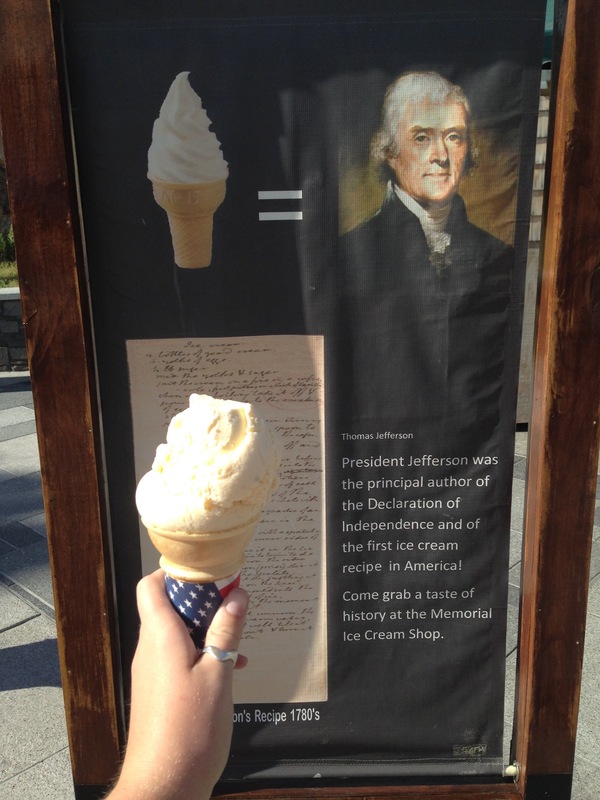 One of our mantras for the trip was “When in Rome” (or Idaho, or Wisconsin, or South Dakota) to remind ourselves to experience each place fully, so when I saw that Thomas Jefferson apparently wrote the first American ice cream recipe, I figured we’d try it. And it wasn’t that good. When ice cream can’t even redeem a place, you know something’s wrong. I can tick Mount Rushmore off my list of visited landmarks now. And never return. Ever. True! We heard good things about Crazy Horse but it was super rainy by the time we left Mt. Rushmore and we were hungry. I think seeing it at night would’ve been better though. Yup, really added wonderful atmosphere (and shielded the multitude of tourists 😄). I went to South Dakota for the Ms. Wheelchair America pageant in 2010. The folks in Rapid City were very friendly and outgoing. Our “fun day” outing for the contestants was a trip to Mt. Rushmore. My first thought upon seeing it up close was, “It’s smaller than I thought it would be.” Our visit was interesting because we had the opportunity to speak to and hear from members of the Lakota tribe. I wish we had gone to Badlands National Park instead. Like you, I don’t feel an urgency to go back. It was smaller than I thought it would be too! Rapid City was a cool little town though. We didn’t have any bison burgers, so sounds like we missed out! I have always wondered what the point of heads carved in rock was. Now I won’t ever feel bad for not seeing it in person!! Y’know, if you’re in South Dakota, you might as well. But not worth going out of your way. We saw A LOT of signs, but I didn’t know it was a must-see. What did I miss? Hahahahahaha. I went to Mount Rushmore when I was 12 or 13. It was swarming with tourists. Overly congested. Not that exciting. I feel your pain. I have to say, though…you missed SOO much of what South Dakota has to offer…Crazy Horse (what’s more exciting than a half finished sculpture of a man’s head on the side of a rock? ), Wall Drug (also known as overly hyped tourist central), AND the Corn Palace of the one, the only, Mitchell, South Dakota (or, who the hell thought this was a good idea in this first place?). Really, though, South Dakota is a bit painful to get through. And North Dakota isn’t much better…at least you didn’t have to drive through both! Driving through South Dakota was traumatic for my family… don’t do it at night! The highway trucks are relentless in their speeding. Oh boy I can’t even imagine! It was raining during our drive and that was bad enough.